Today, just over 6 months after the 8,000th convention was added, the FanCons.com convention database passed the 9,000 convention mark. 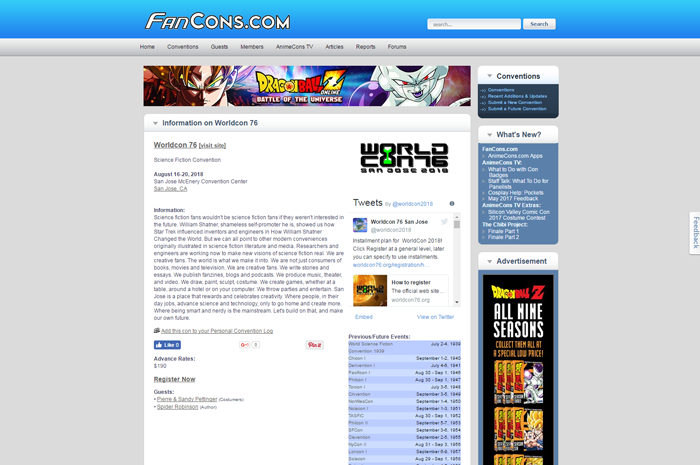 The database began in October 2003 as part of AnimeCons.com, but expanded beyond anime conventions with the creation of FanCons.com in early 2012. The 9,000th convention to be added was one of the longest running and most well-known conventions, Worldcon 76 which is scheduled to take place in August 2018 in San Jose, California. The first Worldcon took place in New York City in 1939. Anime fans, of course, will likely associate this particular milestone with an infamous quote from the English dub of Dragon Ball Z. The line, "It's over nine thousand!" was in the episode "The Return of Goku" where it was spoken by Vegeta (originally performed by Brian Drummond, now performed by Christopher Sabat) has since become a meme. Appropriately enough, the 9,001st convention is an anime convention, No Brand Con 2018, which will take place in May 2018 in Wisconsin Dells, Wisconsin. Even as we quickly approach cataloging information on 10,000 conventions around the world going as far back as 1936, there are still many, many more conventions out there. Any convention organizers who don't see their conventions listed can submit them. After the submission is reviewed for accuracy, the information will be added. All of the data available through FanCons.com and its affiliated sites (AnimeCons.com, FurryCons.com, SteampunkCons.com, and VideoGameCons.com) has been painstakingly entered by hand by a team of unpaid volunteers with an appreciation and love for conventions. Patrick Delahanty is the creator of FanCons.com and executive producer of AnimeCons TV. He has attended 165 fan conventions and plans to visit three more in the next month.